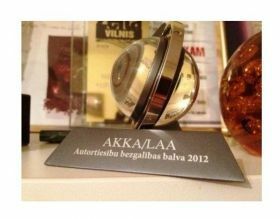 Writers Marats and Lauris were presented the copyright award ‘’Bezgalibas Balva 2012” (Infinity awards 2012) because their works being the most used in Latvia. Song ‘’Es Skrienu’’( I Run) by Lauris Reiniks is recorded in 9 different languages including , Estonian, Lithuanian, Russian, Italian, German, Turkish, French and English. This song is the most widespread song on the radio, TV and live shows. Marat’s song ‘’ Dzīve izdodas’’ (Life Succeeds) is the third most used work after ‘’Gara Dzīve’’ (Long Life) by Prāta Vētra. It is worth mentioning „Es skrienu” song by Lauris Reiniks has an adequate concept of the Infinity Awards, which is created to acknowledge authors whose works are not so much quantitative, but that the works are used in various ways. AKKA LAA thoughts are that the work finds its way to the listener not only in a CD format or in selected works, like poems, but also using the works in theater, as audiovisual works, installations, translating, mobile applications and others in order to create a lasting usage.